I can hardly believe that it's been a week since our last "chat". Fall is glorious and we had a wonderful "Open House" on our farm Sunday. The weather kept people putting on jackets when the sun went behind the clouds, and removing them when it came back out. I bet the sun laughed the whole time!Three of my girls and I went to a big yard sale the day before and had a good time. The weekend was busy, but quite good. Monday was D1's 17th birthday. She was supposed to be born in December, but some folks are just in a hurry to live life to the fullest. That's definitely this young lady. She's a lovely person and I feel privileged to be her mother. Last week's chat included a chance for you to share some of your questions with me. I thank everyone who participated. I will use the questions for today's chat and in the future. I drink tea far more often than coffee these days, but I love sweetened iced coffee. I'd gladly give any housecleaning chores away, but I won't ask Blogger because I'd like them to just keep all of our blogs running well. Trivia- I loathe and detest ironing! I saw my daughter connecting with others and having a good time. That was my primary reason. Second to that was the idea that having a blog may come in handy when I publish some of my projects. Nothing's been published, but I am so happy to have such nice blog friends. You ladies are awesome! 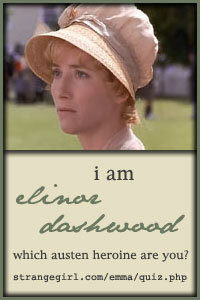 My most famous relative? Hmm? 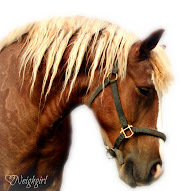 I'd have to say my horse Wendell. He's known around the world. He's practically a household name. Yes. Wendell it is! I enjoyed the new questions. I hope you did too. ***The Simply Linked is at the end of this post. I would like to tell you about two blogs that are having giveaways. Farm Girl told me about them. One is giving a fun Canada package and the other is giving some lovely wool and other goodies. Here they are. Thanks for dropping by. You make me smile! Good questions and good answers! Hi Patrice, I love to read your answers to these great questions. I couldn't think of a great question to ask when I visited your blog and when I thought of one I didn't had time to post my comment. I know I'm late but here was my question. If you won a hundred thousand dollars, what changes would you make? and happy birthday to your early girl! wow! 2 months ahead of her time! God bless her! Ironing is a chore I actually enjoy! Good thing we're all different. Just stopping by to say "hi"....I miss joining in your chats...but life has really gotten in my way lately, with Mom's heart attack. HOPE all is well in your neck of the woods!!! Hi Patrice just popping by, my paws are rather full at the moment! 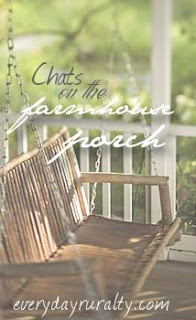 Chats on the farmhouse porch I like it, I wish blogger would run better sometimes. The description of your perm gave me a nice chuckle. Barbie asks: What's your favorite coffee drink? - Ha, that's my question. Right now it's a White Peppermint Mocha! Dreaming asks: What's the chore you hate the most that you wish Blogger would come do? - Laundry! It's never ending! 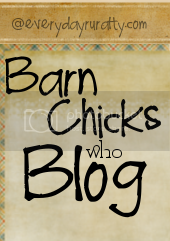 Farm Girl asks: Why did you decide to start a blog? To journal my life in God and to encourage other women. Suzanne asks: Who's your most famous relative? Not sure I have any! Cathy Kennedy asks: Have you ever given yourself a home perm? - Nope! Scary! My hair is thick and heavy too but when I got a perm it held forever. And has remained wavy after all these years. I hope that doesn't mean that the chemicals just never left my brain area. Yikes! Hey, don't tell Wendell about my infamous relative. He has nothing to fear from me, really! Thanks for hosting! Our porch is a bit chilly...so I'll join you from the rocker in front of the fire this week! 1. I never drank coffee until about 5 years ago. Now, one of my favorites is a pumpkin latte - yum! 2. Hey... this is my question, and I can't think of an answer! Perhaps cleaning bathrooms. Yeah...that would have to be it! 3. A friend had a blog. 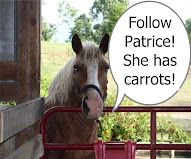 I liked that her horse had a voice and wanted to share my horse's thoughts, too. 4. No one famous that I know of in my family. 5. I didn't perm my hair, but I did try a hair straightener. It was awful. My hair smelled awful - since you weren't supposed to rinse it out - and I had to go to a school event. Bleech!